I call it the quickening, a term also used to describe the first movements of an unborn child felt by an expectant mother. I use it to describe the first movements we perceive on the part of growing plants each spring, the exceptional acceleration of botanical activity that takes place here April-to-May, that frenzied state of hastening changes, barreling headlong into the growing season as wildflowers and trees alike press forward in an eruption of fecundity that takes our collective breath away. Blink and you’ll miss it. Every day brings new leaves, new blooms, new discoveries along the trail. Before the trees put forth their leaves, wildflowers—we call them spring ephemerals for the fleeting nature of their appearance—bloom in profusion across our timbered lands. Generally speaking, prairies and wetlands bloom later; springtime is time for the woods to shine. Bloodroot (Sanguinaria canadensis) flowers may persist for only a few days. Photo from Severson Dells, April 24, 2018. Spring ephemerals appear in the woods early in the season, before the trees put forth their leaves. Around here, a few weeks after the vernal equinox, sunlight reaches the surface of the earth at a fairly direct angle, fueling the process of photosynthesis in woodland wildflowers. Once the trees come into leaf, shade is more prevalent in the woods and spring ephemerals scale back their metabolic activity; some go dormant by midsummer. Food produced by these wildflowers during the brief period of active spring growth may be stored underground in a root organ called a corm. Unlike a bulb, which is layered (like an onion), a corm is a solid storage device. It holds enough food for the plant to survive the lengthy period of dormancy, summer to spring, and feed the plant’s growth until it can refuel, so to speak, by conducting photosynthesis. Sharp-lobed hepatica (Anemone acutiloba) is a delicate flower of wooded slopes. Photo from Severson Dells April 24, 2018. Woodland wildflowers are among the native plants most favored in this region, arriving as they do to grace the land with color and vitality after the long sleep of dull dormancy. We love our spring ephemerals not only for their sudden beauty, delicate and subtle, but also for their role as harbingers, heralding the commencement of the growing season, with all its promise of delights and discoveries to come. Our early blooms signal the release of winter’s hold upon the land, offering cheerful relief from the cold and dark months that came before. And these first flowers of the year entice us to explore our natural areas, seeking out each successive species as it expresses itself in the environment, taking its place in a grand botanical pageant that spans the seasons. It starts with the quickening; don’t blink, or you’ll miss it. We awoke to snow cover on April 9; overnight precipitation left a couple of inches of fresh snow on the ground, blanketing lawns and other vegetation. Areas of pavement that receive the radiant heat of sunlight were mostly free of snow, but paved areas that remain in shade and otherwise protected from the warming rays of April collected two or more inches of fresh powder. In our area, it's not entirely uncommon to receive measurable snow after Easter. By the time April makes its way to the top of the calendar lots of folks around here are impatient for warmer weather. To them, snow in April feels like an event out of time. But we’re just two weeks into astronomical spring, the vernal equinox having occurred on March 20 this year, so it didn’t strike me as particularly strange to see snow on the ground. I was, however, curious about past patterns of snowfall, so I checked with the National Weather Service (NWS) of the National Oceanic and Atmospheric Administration (NOAA) to obtain some “Late Season Snow Climatology” information. It is worth noting that when meteorologists use terms like “normal” or “average,” they usually mean a 30-year average. Here in Rockford, for example, the current NWS “normal” is based on records compiled between 1981 and 2010. According to the NWS, the “normal” last date of the season on which to expect more than an inch of snow is March 20. However, the “normal” last date for a trace of snow is April 11. So the snow we received this week can hardly be seen as highly unusual. Looking back at earlier records, the latest “last measurable snow” in Rockford was May 11 (1966), and that was more than an inch of accumulation. I was naturally curious about the phenology of the first snows of the season, as well. It turns out that the “normal” first date on which we receive a trace of snow is November 2; to receive more than an inch we typically would have to wait until December 5. I was surprised by the earliest first date of a trace of snow (October 3, 1951) and equally surprised by the latest first date of an inch or more of snow (February 7, 1921). On the one hand, we could have snow around here any time between early October (as on October 3, 1951) and late May (like May 24, 1925). Yes, that’s 8 out 12 months during which we might see snow. On the other hand, our first trace of snow might not arrive until the latter half of December (which it did on December 19, 1999) and the last trace snowfall might be over in early March (as it was on March 5, 2012). Climatologists recognize that weather patterns often vary tremendously year-to-year or decade-to-decade. They have to look at long-term patterns to gain an appreciable understanding of climate. And this is why we collect phenology data for local plants, recording the dates of events like breaking leaf bud in the spring and colored leaves in the fall: every year is different. And with every season we witness the cycle of events, turning, spinning, spiraling around and through our perception of the natural world. With the Vernal Equinox nearly upon us (it’s March 20 this year), my imagination turns to the flowering plants. We aren’t seeing much activity yet, of course, but a few specialized species make their move early in the season, taking advantage of the lack of competition as other organisms have yet to awaken from their winter slumber. One of the earliest—and best-known—spring bloomers is skunk cabbage (Symplocarpus foetidus), a denizen of calcareous seeps, fens, and banks of spring-fed streams. Some authorities assert that, of all our flora, skunk cabbage is the first to bloom each year. To be sure, it has its charms, but as flowers go some folks might be disappointed. It looks and smells—more or less—like a wad of rotting flesh. It is no surprise, then, to find that it is pollinated principally by flesh flies (Sarcophagidae family) and carrion flies (Calliphoridae family), which happen to be out and about early in the year, feeding on carcasses and contributing to the nutrient cycle by aiding in decomposition. Often overlooked are the flowers of the silver maple (Acer saccharinum). This fast-growing tree has found its way into our residential landscapes as an opportunistic volunteer, but its shallow, spreading root system may lift sidewalks, causing them to buckle, and may enter drain lines and sewer pipes, blocking their capacity. Silver maple’s relatively brittle wood, in combination with its growth form, leaves the trees susceptible to damage from wind, ice, and snow. And while they may not be ideal street trees, silver maples perform essential ecosystem services, playing host to hundreds of species of beneficial insects, as well as providing forage and habitat for many birds and mammals. Their natural habitat is alluvial forests such as those occupying floodplains along our water courses. The flowers are tiny and have no petals, but the stamens, pistils, and floral bracts may present a rich, reddish-pink color. While the flowers may bloom as early as February, they often escape our attention (situated high in the tree) until storms knock them to the ground. One of my favorite native plants to present its flowers very early in the year is American hazelnut (Corylus americana), which usually enters its bloom period in the middle of March. We have a fine, tall specimen near the Severson Dells Nature Center, so I have been watching it daily in anticipation of seeing its welcome demonstration that spring is arriving. Hazels bear separate male (staminate) and female (pistillate) flowers on the same plant (what we call a monoecious plant species). The male flowers form during the growing season and remain immature through the winter, visible as catkins, dangling from the twigs of the shrub (and making it relatively easy to identify hazel during the winter). The catkins elongate to about 2 to 3 inches or more as they mature in mid-spring. It is the pistillate flowers that I look for in March. While most of the flower remains hidden within its protective bracts, the slender, magenta stigmas are exposed, filamentous in the vernal air. Hazels, like maples, are wind-pollinated. The fruits (hazel nuts) are beautiful brown orbs wrapped in dramatically fringed bracts. In appearance, the nut is similar to that of the European filbert (Corylus avellana), a close relative, but the bracts of the American hazelnut are distinctive. 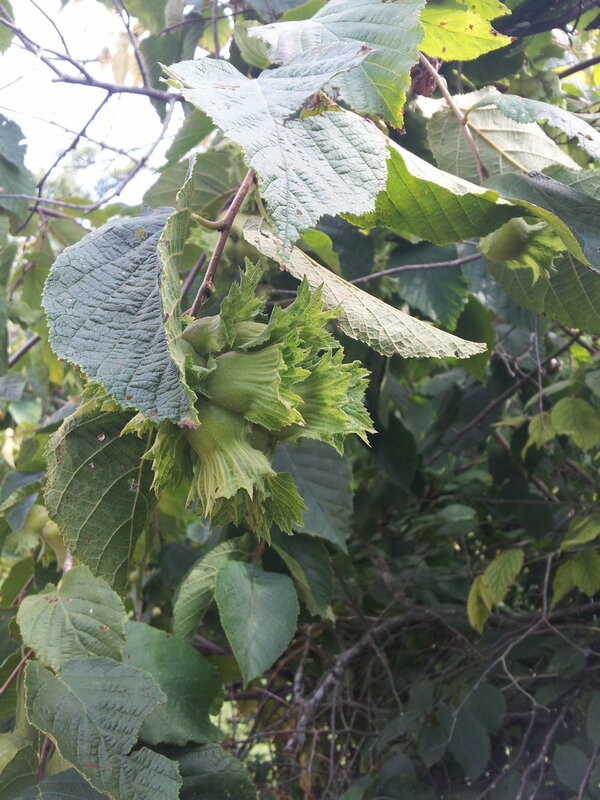 It can be difficult to collect hazel nuts, they are prized by squirrels and other wildlife. And while hazel brush was frequently noted by surveyors who crisscrossed the region during the early nineteenth century, we see relatively few specimens today, mostly due to habitat loss and encroachment from invasive species. So, before those beloved woodland wildflowers even begin to festoon the forest floor with their blooms of white and yellow, look to the trees and shrubs above for some of the first flowers to burst their buds and herald the coming of spring.